We all know the importance of exfoliating the skin, not just in terms of skin renewal but also for increasing the effectiveness of the products that are applied afterwards. Serums can penetrate more deeply and masks are also more effective on exfoliated skin. The problem is that exfoliating can be tricky for those with sensitive or reactive skin, particularly when it comes to chemical exfoliators. Today I want to share a product that is perfect for those who usually shy away from acid toners as it's perfect for sensitive skin. 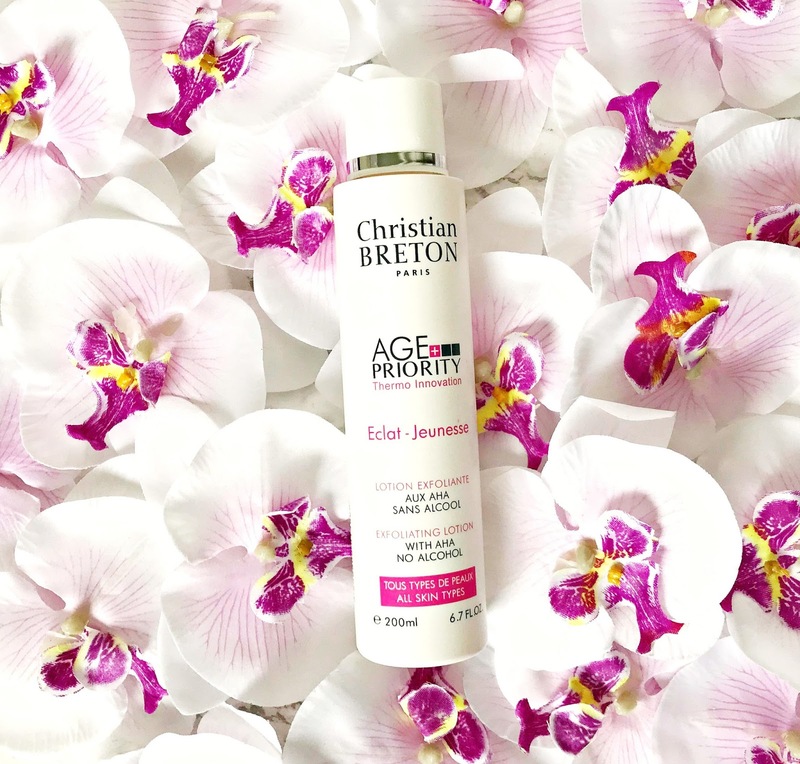 Christian Breton Age Priority Exfoliating Lotion is alcohol-free so it doesn't have the drying effects of some toners. It contains a combination of AHAs (glycolic, lactic and malic acids) in the form of fruit acids, which are effective enough to exfoliate the skin, yet gentle enough to use on a daily basis. I apply some on a cotton wool pad and swipe over my face and neck after cleansing. There is no tingle that is usually associated with acid toners and no redness or inflammation afterwards. The result from regular use is radiant, even skin. If you are a regular chemical exfoliant user, you would probably find this too mild for your skin but it is perfect for those who are new to acid toners or who usually finds that acids are too harsh for their skin as it will still give the glowing and polished effect but without any of the tingling or redness that can accompany stronger toners. Last Autumn, I wrote about some sheet masks that Christian Breton sent me, which I loved (here) and more recently, I used the Charcoal Sheet Masks, which are perfect for when your skin is congested as they contain charcoal, which draws out impurities and volcanic ash, which eliminates toxins. On their own, these two ingredients might be too harsh for my skin but combined with algae, they soothe and calm the skin, making them perfect for my reactive skin. Have you tried either of these products? Do you like acid toners? I'd love to hear your thoughts! All products are bought by me, unless otherwise stated. These products were kindly sent to me. Opinion is always my own.